New! The latest menu is up for the perusing - six figures went up about five hours ago, and at press time all six are still available. Three Nobotos, two Gobons, and a Pheyden were produced making this drop unusual in that it's the first in nearly a year with neither an Armorvor or Crayboth. At press time, the item closest to selling out is Standard Gobon, which is the very first "standard" version of the tubby fellow to be produced. Click here to check availability and order yours, or don't, and be sad. A new Glyos drop is live now! 3 Nobotos, 2 Gobons, and a Pheyden are up for grabs - and one of the Gobons is already below 50 units! This drop is notable in being the first time you are actually able to pay for a Noboto - the last drop was a freebie in either Ivory or Clear Colorless plastic. Three flavors are available today. Click here to go to the shop, and like always we'll post the full menu tonight or tomorrow. Good shopping! New! The Onell Design crew have 6 new figures tomorrow, 5 of which have been revealed. Three flavors of Noboto will be joined by a pair of Gobon figures, plus a sixth mystery figure. A new mold? A new Armorvor? Each new figure is $8.00, including the mystery release. Be there at 9:30 Eastern to find out what it is! The Weaponeers of Monkaa line came out last year and hasn't done too much in that time - the 5 1/2-inch high figures share a lot of similar parts and are basically recolored and reconfigured versions of a very versatile design. The OMFG Gohlem deviates from the usual formula, giving fans a mash-up between Monkaa and the October Toys OMFG line. This Gohlem has the OMFG symbol on one side of its chest! The other faction symbol is a Gohlem Face/Fist, so it's pretty nifty and new enough to be interesting. There's a lot of color in Glyos but rarely is there enough red. The insanely bright and chipper red used on the Neo Aves Exellis Action Figure came out as a wave of goodies earlier this year, complete with matching Hub, Axis joints, Crayboth, and a Glyan too. The last time we saw a bright, opaque red was a Buildstation Gendrone (Buildman) around 2010, but a couple of slightly darker red figures have popped up here and there. It's really a sharp figure, and this color is particularly fitting given the Onell Design-originating nickname "Exellips." With the scarf, it really does look like the Sincroid has on a giant pair of novelty wax lips. They're coming! Standard Noboto and Standard Gobon have been many years in the making, and they're part of a 6-figure drop on Sunday at 9:30 PM Eastern. Artwork for the Standard Gobon was shown years ago. ...I hope to get both. I'm pretty pumped to see all these "Standard" releases, they look great! On paper I had no reason to snag a Standard Crayboth MK II, but I got a glimpse at the pictures showing it was, in fact, different enough to be interesting. 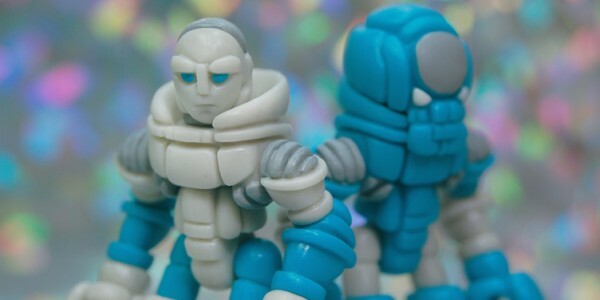 If you've never played with one before you'll be amazed, but odds are if you're reading a Glyos review, you're probably a low-level expert on their various offerings by now. 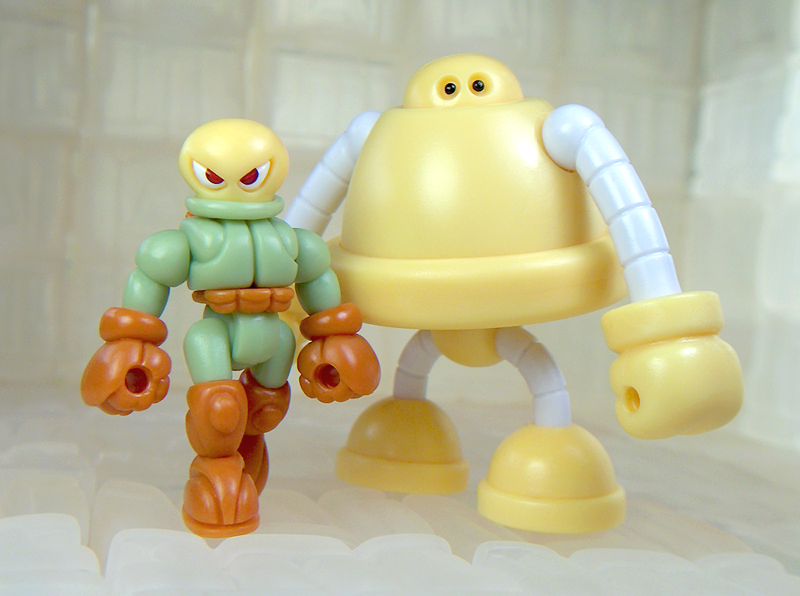 It's similar to the original Standard Crayboth (seen below) but with a few superficial changes, not the least of which is packaging - the original Crayboth figures were 2-packs in small boxes, which were eventually phased out. The 2013 model comes to you in a plain clear wrapper. I'm a pretty big sucker for glow-in-the-dark toys, even if it's a mold I have a few times over. The Banigoth Horde Ghost Troopers (Assassination Squad) deliver the goods with a gimmick I've been told most major toy manufacturers view as a cheap feature or a cop-out, yet one I find endlessly delightful. If Hasbro gave me glow-in-the-dark Clone Troopers or Cobra Troopers, I'd buy. If Mattel did a glow-in-the-dark Skeletor, I'd buy that too. The more flippant the excuse, the better - I love seeing my figures when I switch the lights off! For those not in the know, there's this guy Nicholas Merz that has, for years, customized and cast various figures under the handle "Ni" or "Ni Stuff." He's expanded his offerings into the 481 Universe, which includes numerous characters - although he hasn't had many go to production just yet, beyond his Anamolies PVC figures and some Glyos-compatible heads. Until now! The Outlander Silas is one of two releases this month of an entirely newly-tooled figure that, at first glance, seems like a hybrid of the Callgrim and Pheyden characters. When I saw the initial drawings, it took me a minute to realize that it wasn't a mashup of those two. The style of the figure and the original drawings very closely matches that of Onell Design's product, but when you see the fully-molded figure there's no mistaking it for anything other than an original creation that closely matches the style. Weaponeers of Monkaa SDCC Exclusive: MUSCLE Flesh Color W.O.M.O.M.F.G. 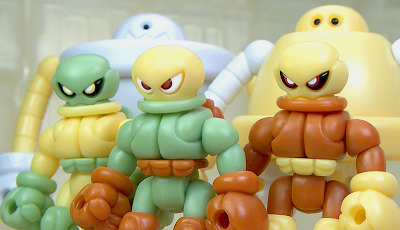 The Weaponeers of Monkaa San Diego Comic-Con 2013 exclusive is coming! It's $12 for an "OMFG Flesh" figure with all 6 heads and all weapons - actually, not a bad deal at all. The W.O.M.O.M.F.G. has yet to be revealed in picture form, but the Spy Monkey Creations blog did post a shot of the cardback. Spy Monkey Creations shares a booth with October Toys, which will be selling exclusive OMFG Series 2 as well as OTMF Baby Deadbeets on the cheap. Visit booth #4951 for those! Depending on who you talk to, the Reydurran Operations Unit Mini Blocker Rig Action Figure is either a figure or a vehicle. This slightly smaller evolution of The Rig from a few years ago, and at 3 1/2-inches tall looks and feels like a cross between an expensive art piece and a cheap toy you had as a kid in 1982. The design has 4 pieces which pop apart at each joint, although in my experience the arms are really tough to pull out so I won't be doing that again. Due to the placement of pieces, the arms are more or less immobile unless you twist the figure at its waist roughly 90 degrees, in which case they rotate any way you please. You can still rotate them up a bit in the default mode, although it rubs against the body and I try to avoid that sort of thing. The "vehicle" aspect comes in from your being able to pop the Rig in half and stuff a figure inside, although with no seating or cockpit it's more of a way to store a figure than to have it pilot a vehicle. (I've had a few arguments over this one, so your mileage may vary.) As it's a contained thing with no visible driver, I see it more as a nifty figure. With art from Marty "The GodBeast" Hansen and Matt Doughty of Onell Design, you need to see the post "THEGODBEAST KABUTO MUSHI MKII prototypes." 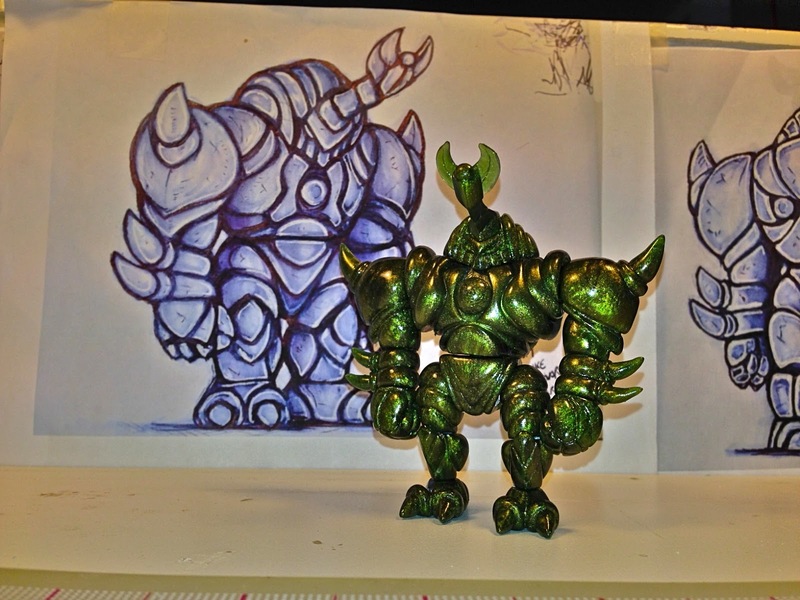 Based on a previous figure from The GodBeast, which itself is based on a popular pet in Japan where kids raise a rhinoceros beetle from a larva, this rather large new figure is in the early stages of preproduction and is expected to be hand-cast and produced on a limited basis in the future. With recent photos and artwork dating back to 2011, this is an item long in the making and one I hope makes the transition to a full-fledged plastic Glyos-compatible release. For the time being, I'm sure we'll all be watching its development to see what might be on the horizon. Update: Silas and the Outlander are both up on the store and on sale as I write this. Click here to order. Update #2: Silas and the Outlander are both sold out. The long-awaited Ni Stuff Outlander goes on sale tonight! 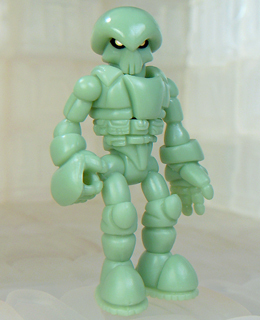 This Glyos-compatible figure is $12.00 and is made from many parts. It will be joined by a new batch of purple Anomalies mini-figures. If you are unfamiliar with the Anomalies, they're nifty - click here for a review of the silver ones that we posted late last year. Also, check out this new video he posted. While the Ivorinium Noboto is one of the first two colorways of the character, it's been in development for a very long time. This blog post from 2007 is one of the first public showings of the character, and to add an unfortunate twist to his long path to production the figure's initial release was scheduled for June 14. A major disruption of the Paypal system backing the Onell Design store resulted in another delay, but that was good news for fans - because Noboto became the freebie when the sale took place again just over a week later.